If you’re looking for a Fishers Extension Braiding Salon with expert stylists and a warm, welcoming environment, then you’re in luck – Rama’s is the place for you! At Rama’s we’ve been in the hair care business in Fishers for more than 15 years. That’s a full decade and a half spent serving the men, women, and children of central Indiana by providing first-rate braids, weaves, twists, and extension braiding. Our highly-trained stylists have all the skills and experience needed to make you look your very best. 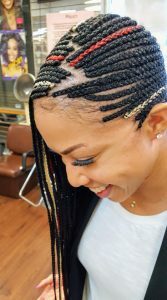 Whatever hair style you’re going for, our Ramas braiding salon staff can help you achieve it; just describe your desired look in detail or bring a picture, and we can match it. If you’d like to talk to us about the many hair extension braiding style options available to you, feel free to come visit us between the hours of 9-6 on Mondays through Saturdays or 10-4 on Sundays. To make an appointment at Fishers Extension Braiding Salon in advance, just give us a call at 317-496-8229. 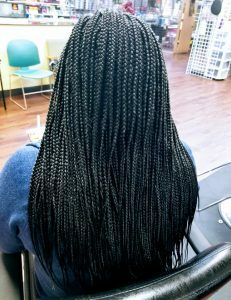 If you’ve never had extension braids before, you might expect that they look artificial and are easy to spot, but nothing could be further from the truth. In fact, extensions blend in amazingly well. The texture of your extension braids is so similar to that of your natural hair that no one will guess that you’re wearing them! When you have extensions put in your hair, you’re not only creating more length and volume, you’re also covering up years of bad hair care. Extension braids are an excellent way to hide any hair that’s been damaged by harsh chemicals, heat, styling products, the elements, etc. Say good-bye to your split ends, because you won’t have to see them for a while after you get extensions. And it’s not just while the extensions are in your hair – even after the extension braids have been taken out, you’ll still see their benefits. 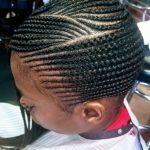 That’s because extension braiding is a protective hair style; they help preserve your natural hair, allowing it to rest and recover from damage. It’s amazing how much hair styles can change the way you look. There might be some women who can pull off short little hair-dos and still look young, but they’re most often associated with older women. With some awesome extension braids in your hair, you’ll be taking years off your appearance. If you enjoy trying new things, including new braiding hair styles, then extension braids are a great choice for you. When you come to Ramas Braiding Salon, you can try any number of looks. Do you want to see what life is like as a platinum blonde? Would you like to try out some romantic waves? Or maybe you’ve always wanted to have super long hair that goes down to your waist? Whatever hair style you’ve been wanting to get, now’s the time to try it. Extension braiding gives you a chance to experiment without the long-term commitment that comes with a haircut, dye job, or perm. Compared to caring for your natural hair, having extension braids gives you a bit of a maintenance break. You don’t need to spend nearly as much time in the bathroom every morning making sure that your hair is just right. With hair extension braiding, you can style your hair in a hurry. You might expect to pay an arm and a leg for longer, fuller hair but you’d be wrong – hair extension braiding is surprisingly affordable! At our hair extension salon you can look great without having to empty out your bank account. If you’d like to find out exactly how much hair extension braiding will cost you, feel free to contact our Fishers Extension Braiding Salon. We can be reached by phone at 317-496-8229 or through the contact form on this site. Our stylist look forward to hearing from you and getting to make you look and feel your very best!